Measures to improve how Wales deals with its waste have been proposed to the Welsh Assembly Government. Environment Minister Jane Davidson wants Wales to adopt more sustainable waste management practices. She hopes Wales will become a high recycling country by 2025 with aims to reach a Zero Waste country by 2050. There’ll be targets for local authorities to recycle and compost, with financial penalties if these targets are not met. Certain materials will also be banned from going to landfill, like biodegradable food waste which could be used as biomass fuel. The announcement made by the Assembly also includes plans to start charging for plastic carrier bags in all shops from 2011. The concept of ‘Zero Waste’ is to try and recover as much energy from our rubbish as possible, and options on how to do this are being researched by a group of local authorities. Prosiect Gwyrdd is a partnership between, Caerphilly Borough County Council, The County Council of the City and County of Cardiff, Monmouthshire County Council, Newport Council and Vale of Glamorgan Council. They are looking into the different ways of turning waste into energy, through modern incinerators (also known as combined heat and power), or anaerobic digestion (where the methane gas produced when waste decomposes is captured to be used as fuel). We are doing quite well when it comes to recycling in South East Wales. For the last quarter the figures are as follows. 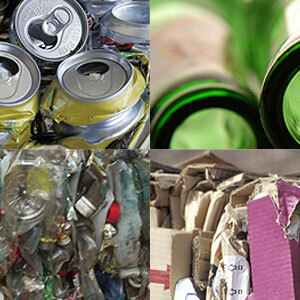 On average there’s been a 3% rise each year in the amounts recycled since 2001. Its admirable that the Welsh Assembly are committed to reducing the amount we send to landfill and that schemes like Prosiect Gwyrdd are looking into ways to convert our rubbish into energy. However – will ruling with an iron fist work (dishing out fines to councils left right and centre) or will it just hinder any further progress? Surely working to financial incentives and encouraging better waste management is better than penalising councils for not being up to scratch. Call me a cynic but if councils are fined, then surely it’ll be us lot who suffer in the long run when we have to cough up more council tax.